Every year, my two roommates and I have a halloween party. Since we're the hosts, we always coordinate outfits. 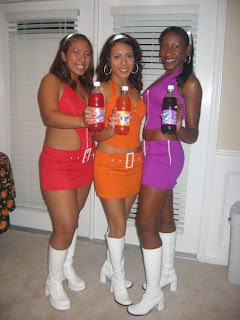 Last year, we were the fanta girls and it was a big hit. This year though, we wanted to shock everyone's socks off and go for something even bolder. 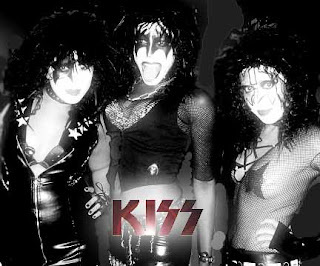 So here's last year's and this year's halloween pics...this year we were KISS! Well at least a sexier more female version of the 70's rock group, he he. I did the makeup using a cheap makeup kit from the halloween store...it was more challenging than I thought, but it turned out well. FYI, I photoshopped the KISS pic to make it look rock star glam...don't tell my roomies, but i'm printing the pics to be part of their x-mas gifts. Now the only thing is...what are we going to be next year! Any tips are welcome! That is awesome. The Fanta girls idea is so cute! And Kiss... Girl, I admire all the work you put in to create those looks. It turned out really nice! thanks Fei :) i have no idea what we're doing next year!